In the summits of Ethiopia live primate known as the monkeys of the bleeding heart , a most curious animal that has been relegated to the mountains of this African country. We are talking about the gelada ( Theropithecus gelada ), the last living species of this genus of primates whose fossils are dispersed throughout much of Africa and even Spain and India. The monkeys of the bleeding heart remember the baboons , although they do not belong to the Papio genre. They are also terrestrial animals of great size and brown fur, which can exceed 20 kilograms in weight and in which the females are much smaller. However, they differ from geladas in that they possess a snout snouter and a face with less fur and, moreover, for the reason why they are known as the bleeding heart monkeys: have a patch of reddish skin that stands out in the chest of these formidable animals , and that even stands out even more in females with estrus. The monkeys of the bleeding heart reach their adult age around four years , although in Sometimes they do not reproduce until they are 8 or 10 years old due to their low range. They can live for two decades. These primates are adapted to herbaceous consumption, so they have relatively small fingers and incisors in comparison with primates of the same size. They even move bipedally to have their hands free and manipulate their food. And geladas are one of the few primates that have such a specialized diet in grass, which makes up 90% of your diet. Although they also consume small roots, flowers, seeds and rhizomes. These bleeding heart monkeys live in complex groups organized at various levels, which may end up bringing together hundreds of copies. Normally, males migrate from groups, although this is not always the case, while females frequently remain in their birth group. 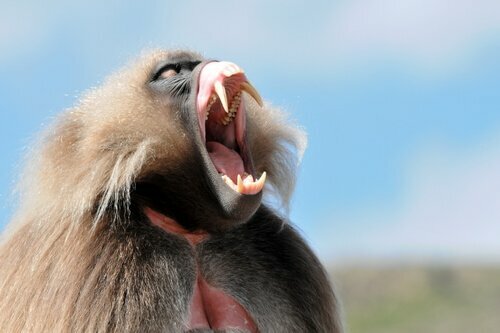 The females have quite a lot of power in gelada groups, and males often interact with them. with grooming instead of with aggressions, since a coalition of females can reject a male trying to overthrow the dominant. Among the geladas have been fascinating behaviors: from its association with the Ethiopian wolves to concepts like infidelity, in addition to a repertoire of and very complex vocalizations that resemble human conversations. 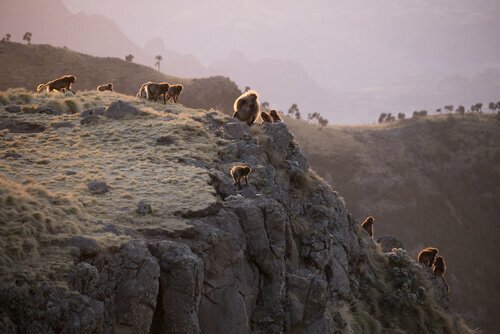 The geladas live in mountain pastures, more than 2 000 meters high, although they can be more than 4,000 meters above sea level, with much cooler temperatures that avoid periods of drought. It is important to note that this species can only be found in Ethiopia. strong>. It is feared that climate change will end up cornering them, although formerly their biggest threats were hunting for experimentation and for their skins.